They are perched on an ancient hill in a city of seven hills. 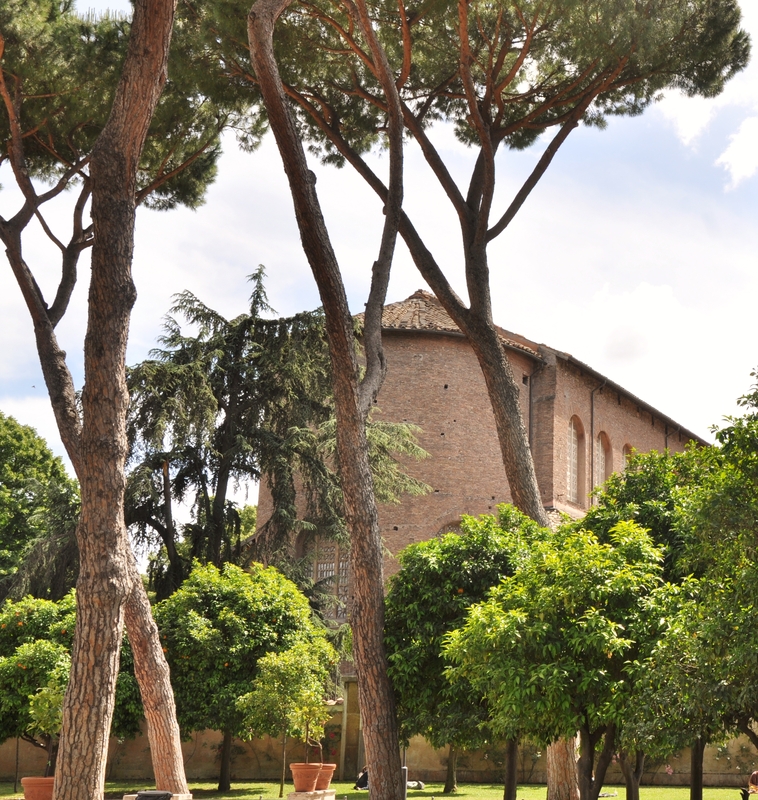 A handful of trees stand in the sun among towering Roman pines overlooking the Palatine and its mounds of ancient Foral buildings. It is a small orchard, and yet a haven of peace, found ensconced in an ancient patrician villa turned Dominican convent, on the peripheral border of that ancient city. These trees, rising and laden with fruit, thrive in the arid and dusty soil of Rome, their roots anchored in the earthen dirt that first saw the martyrs’ witness to a nascent Christianity. They are surrounded by places of pagan sacrifice visible in layer upon layer of transformed ruin. The goddess Diana stands guard. Remnants of her temple, now a distant memory, are hidden down a quiet street behind villa walls. In memory, a work on spring come to mind; Botticellian orange groves, depicted on canvas with the lightness of an ethereal beauty. At times, the peace of that enclave is pierced by small crowds of visitors who venture upwards from the crowded streets of the Palatine landscape, to see some ancient churches, the remains of the martyrs they reverently hold, and to peer through a keyhole from which Michelangelo’s Petrine cupola masterwork rises perfectly placed against the Roman horizon. It is as if a pilgrim procession migrates from that pagan basin, upwards, towards that corner where a persecuted Church first began to bear luminous witness to Redemption incarnate. What then, is so striking about these trees? It is not as if they are themselves unique–although one in particular is different from the rest, in that its roots are a few hundred years old. Perhaps it is the reminder they are of parts of the world where the sun shines blazing rays and produces harvests of heavenly delights. Perhaps it is the place they are in — a hilltop from which one sees centuries of human history, arching as if a vision of the eternal in the context of the currently human. Is it their juicy, ripened fruit, turned modern fragrance or epicurean delicacy? Or is it simply that they are beautiful, and in so being, direct us to contemplate Beauty itself? It is no accident that we are drawn to beautiful things. Beauty is a salve on bruised hearts and souls, a vision of glory that manages, even for a brief while, to transport us away from the ordinary, the mediocre, the irreparably dark recesses of faithless existence, into that place of aspiration, of contemplation, of encounter with mysteries beyond our imagining. The manifestation of beauty is a foretaste of the delights of paradise, an antidote for the existential impairment and eschatological blindness to the truth. It is a portal to prayers of praise, and the possibility for that privileged entering into the gates of thanksgiving. No suffering, no joy, is void of this experienced beauty. Hidden beneath the dusty, stone ridden paths of our physical life is a wellspring of grace, waiting to be unleashed on the arid landscape of a hardened heart. Like those Sabine trees, standing in that Roman breeze, arching in the courtyards of ancient history above the valley of the pilgrims, gracing a place of prayer and martyred sacrifice, whose excellence is how they magnify the created order, and remind it of its perennially destined glory.